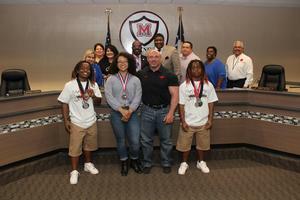 The Manor ISD Board of Trustees recognized four powerlifters from Manor High School during Monday's regularly scheduled board meeting. 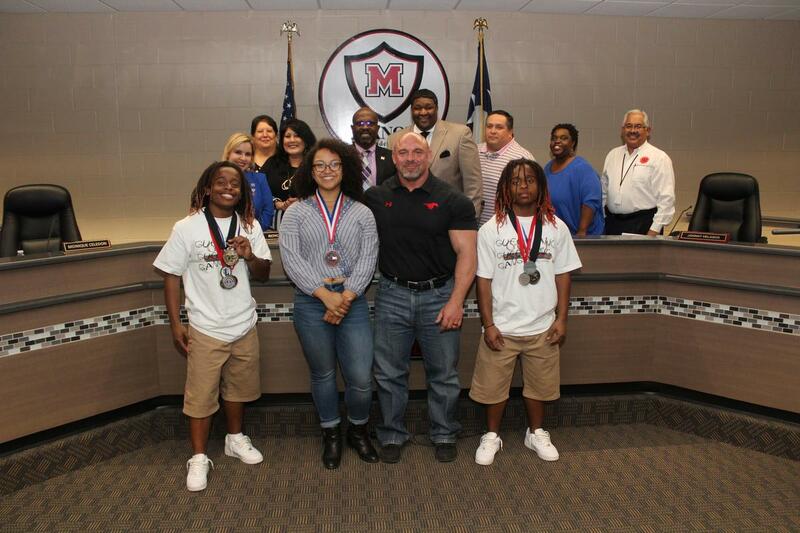 Powerlifters Jayla Quichocho, Kaleia Rowland (Not Pictured), Jeremiah Thompson and Journey Thompson all placed highly in the state competitions. Jayla and Kaleia participated in Waco, Texas. Jayla finished first in region, and fourth overall in state in the 181 lb weight class. Kaleia finished 20th in the 97 lb weight class, but the junior also weighed in the smallest at 83 lbs of all the competitiors. The Thompsons both participated in the Boys Tournament in Abilene. Jeremiah finished 8th in state at the 123 lb class, and was the Regional Champion. Journey was also in the 123 lb class; finishing 11th in State and Regional Runner Up.